A friend of mine hosted a surprise party to celebrate her boyfriends graduation from the Corrections Academy. We personalized the event with little law enforcement touches. The guest of honor had no idea, the surprise came off with a "Bang!" DIY banner made by enlarging a picture of the patch from his uniform, and photo shopping the letters inside of the patch. I am really feeling these Billy Balls. They are so pretty and playful. 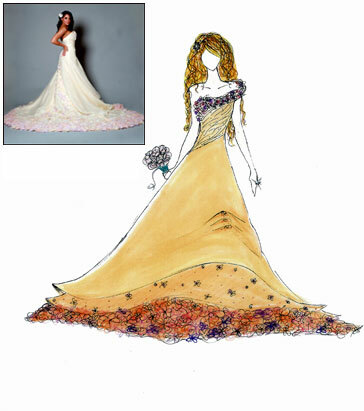 Brides magazine launched Operation Dream Dress earlier this year, a chance for aspiring designers to create dresses around the theme of visionary romance. Check out the entries of the final five contestants who appeared on "GMA". 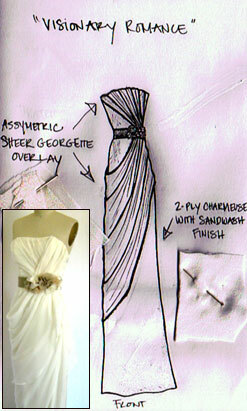 Amy Wong Micucci's Winning Design: A gown fit for a goddess, this strapless design has satin banding and chiffon flowers at the waist. 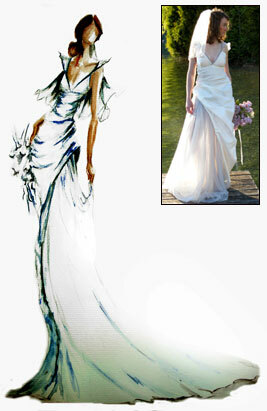 Bratten pointed out "the beautiful draping" and "the fresh, modern, romantic wearable look." 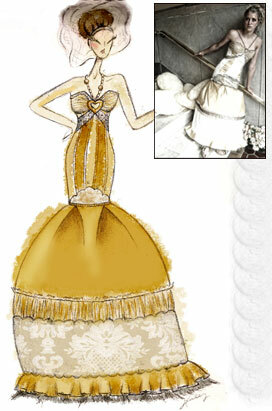 Micucci, from Beverly Hills, Calif. has her own line of bridesmaid dresses. 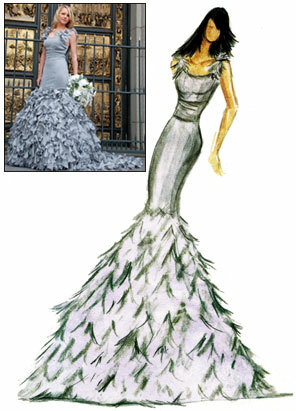 Micucci's winning design will grace the cover of the November/December issue of Brides, and David's Bridal will manufacture her dress nationwide. And Wine if you please.... Have a Wine and Cheese Party! For all you wine enthusiasts, this party is a must see! Chris over at Celebrations at home hosted an amazing Wine and Cheese Gathering. The details from this party are on point! I wish I was there, you will too! 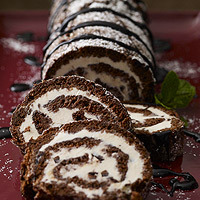 Just head over to her blog and check it out for great ideas and inspiration. Here are additional inspiration for you. 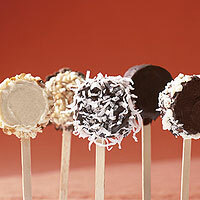 Stick these Wine Cork picks in your appetizers! 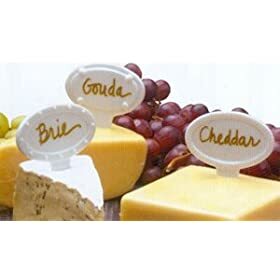 Stick these White Porcelain Cheese Labels in your cheese! You gotta have Cheese Boards and Lazy Susans for your cheeses. How cute to put a bottle of wine in these Fish Net Wine Bag from Pottery Barn. Or bath beads favor that looks like grapes! 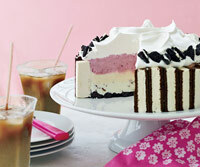 I scream, you scream, we all scream for icecream and who doesn't love cake!?! Put them together and what do you get? 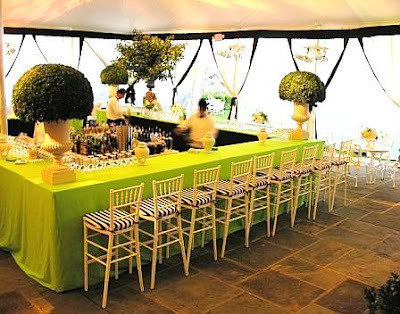 For some reason I seem to be on a Spring,Summer garden outdoor party kick ( I wonder why :-)). So let me keep on rolling with it. Bird cages not for the birds! I love love love the look of birdcage decor and centerpieces! How cute would this be for a garden baby shower! 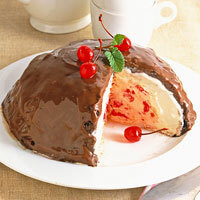 Planning an outdoor garden party this season? 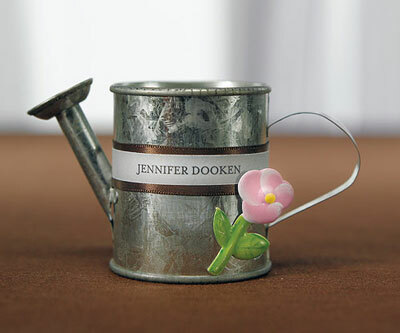 How about using watering cans for your decor. Lovely for an outdoor tea. How cute, use as a favor by filling it up. Or maybe even as a unique way to display your guest name,"placecard." When you think of urns, your probably think rustic. But when I saw this piece in a Fl mall, I thought how chic! 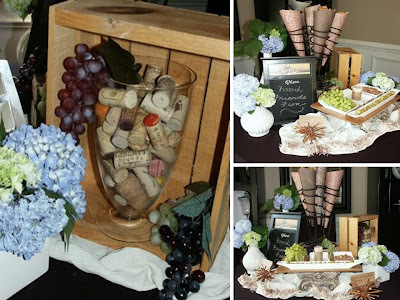 Using urns doesn't have to give off a rustic vibe. Urns cane be elegant, romantic, chic, and even dramatic! 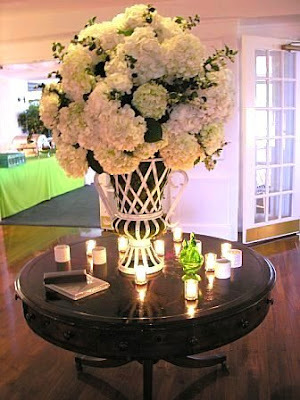 Here is a dose of inspiration if you are considering decor using urns for your event. I love this urn, it give off a fresh botanical feel. 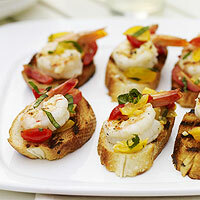 I love bruschetta, add shrimp and I love it even more! 1. Place shrimp in large resealable plastic bag. Add white wine and 2 teaspoons of the minced garlic. Marinate at room temperature 30 minutes or in refrigerator for a few hours. 2. Cut grape tomatoes in quarters. Heat oil in medium-size skillet over medium-low heat. Add the remaining garlic and cook 1 minute; add tomatoes and cook 1 to 2 minutes or until slightly softened. Stir in basil then remove from heat. 3. Heat gas grill to medium or prepare charcoal grill with medium coals. Remove shrimp from marinade; discard marinade. Place shrimp in a grill basket and grill 6 minutes, stirring. Remove and cut in half crosswise, if desired; stir into tomato mixture. 4. Cut 8 slices bread, about 1/2-inch thick. Brush both sides with a little of the oil from the tomato-garlic skillet. Grill bread 3 minutes per side, until golden-brown. Serve topped with shrimp-tomato mixture; sprinkle with a little sea salt, if desired. There are many couples out there planning to getting married, but because of the state of the economy are holding off on purchasing a ring. Looking for a deal? Check out I Do Now I Don't to find great jewelry at terrific prices. Diamond rings and jewelry that range from $500 to $50,000 and even higher. You don't have to pay retail. Purchase jewelry directly from individual sellers motivated to make a sale. Or if you happen to have pieces that you no longer will need, sell it to I Do Now I Don't and make extra $$! 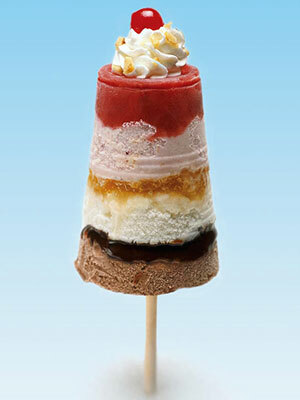 How cool are these delicious deserts to serve up at your next summer gathering. 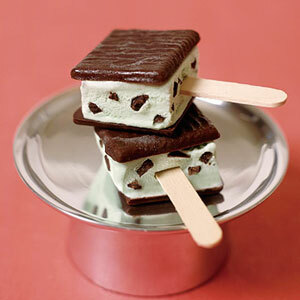 Mini Ice cream Sandwich.. on a stick! Did you hear? 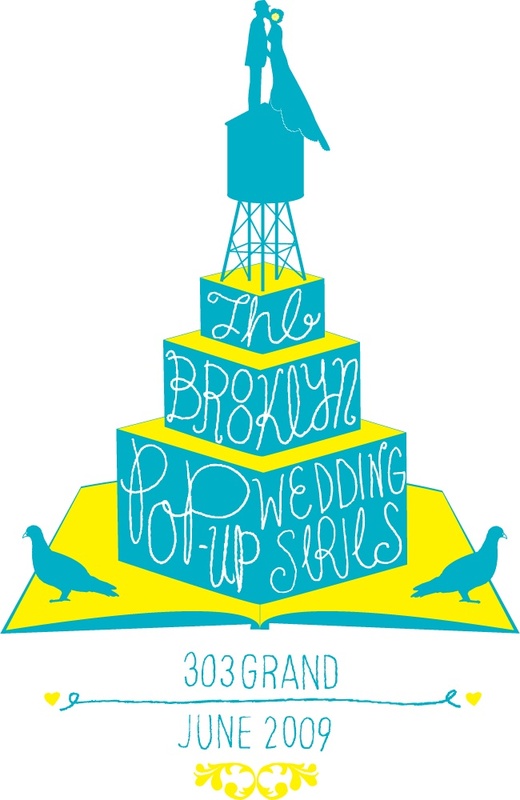 The Wedding Library is going to be in Brooklyn for the entire month of June. Last weekend I hosted a baby shower for my brother and sister in-law. It was another pink and green affair! Everyone just seem to love that color combo. 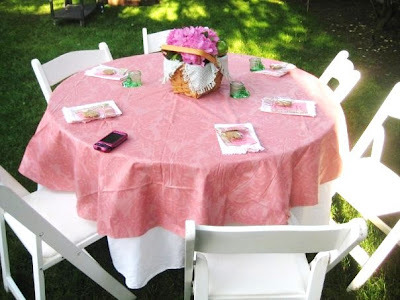 The shower was held outdoors, the weather was perfect for a baby shower picnic. Remember the store bought invitations turned custom? It was for them! They are having a baby girl, so I just had to go with Sugar,Spice and everything nice. Want some sugar? 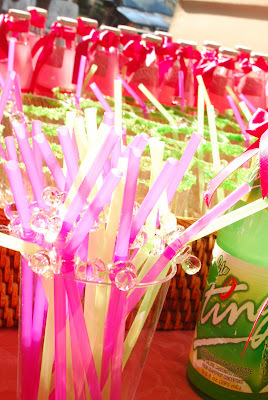 Bottles of pink grapefruit sodas (Ting) were given to guests as a favor.